The belly can one of the hardest areas to tackle when you’re trying to lose weight and get in shape. No matter how much you go to the gym and eat healthy, it can feel like that belly fat just doesn’t want to budge! The trick is to combine a bit of extra home exercise with the regimen you’re already following. Biologically, the fat on the abdomen is meant to protect the fetus during pregnancy. However, since pregnancy is only a short period of life, the rest of the time you want to have a beautiful and flat stomach. Unfortunately, the stomach and sides are the first things that gain weight, and the last things that lose weight. In order to get rid of fat in this area and to create a beautiful body, you need to limit sweet and sugar consumption, and also to perform simple exercises on a regular basis. 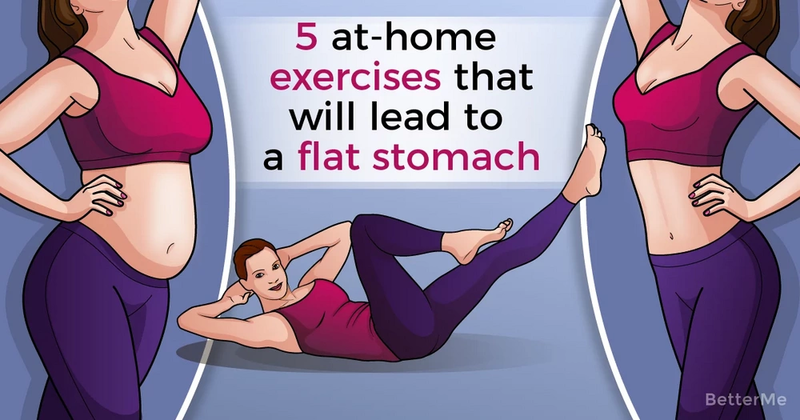 All these exercises are very effective and will help you get rid of abdominal fat after about fourteen days. Do not waste your time, put on sport clothes and start working out straight away.